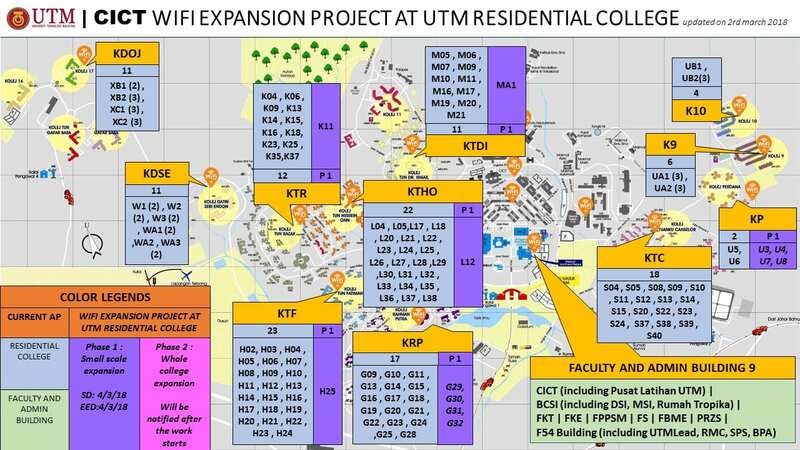 Notice for WIFI EXPANSION PROJECT AT UTM RESIDENTIAL COLLEGE (Phase 1 : Small Scale expansion) is reffered. Kindly be informed that the installation of this wifi will start on this Sunday (4th March 2018) until it is completed. The installation period is expected to take about two weeks. Kolej Perdana at blocks U3, U4, U7 and U8. Please also note that work is currently underway for Phase 2 : Whole college expansion which involves other colleges and blocks. More information regarding this phase will be notified after the work starts.